If you are like me and love a deep umami punch in the palate, then kimchi is the ferment for you. It has a spicy slow burn from Korean chilli and the fermented funkiness of fish sauce. 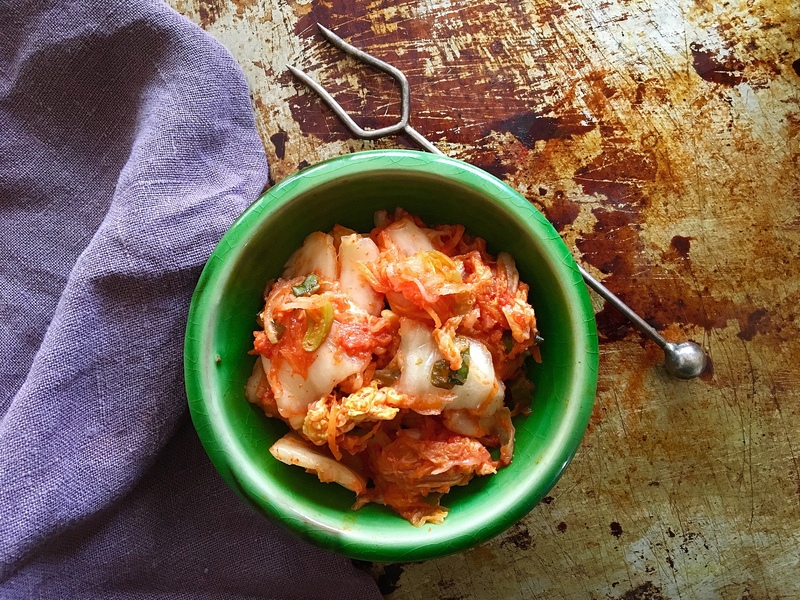 Kimchi has become embedded in the Korean national identity. It has crossed borders to other East Asian countries like Japan and China where it also loved. Asian cabbage and radish are the most common vegetables used and typical of kimchi eaten in the West. If you do travel to East Asia, you will find an almost infinite number of local interpretations of kimchi that reflects seasonal ingredients and local taste. The deep umami taste is addictive. Kimchi is also good for you when eaten in moderation. There are many scientific studies published that are helping us to understand the potential health benefits of kimchi as a good source of nutrition, being antibacterial, enhancing our immunity, having an antioxidant effect and lowering cholesterol. Sun-dried Korean chilli (gochugaru) is a wonderful beast. It has a distinctive flavour; the heat is a slow burn that creeps up on you, not before you have a taste of its smokiness and fruity-sweet notes. The colour also adds a bit of drama to everything it touches, especially kimchi. The variety of chilli is related to Hungarian paprika which is also intensely coloured. Koreans have been planting and harvesting this particular type of chilli, that is biologically different from Thai and Mexican chillies for at least 1,500 years. The Scoville scale is a scale that measures the strength of heat of peppers and chillies. Korean chilli sits at under 1000, at the lower end of the scale. Spicier than paprika, however, not having the punch of a Mexican poblano. This rating is important in the fermentation process as intensifies the heat of the chilli. If you substitute another chilli, not only will you not get that wonderful sweet, smoky flavour, you will also have kimchi that is too hot to eat. Your local Asian grocer should stock Korean chilli powder, also called Korean pepper powder. Let me say before we get to the recipe – this is by no means a traditional method. In my time poor world, I cut a few corners and in doing so can make it more often. When making the real deal, you can ferment the paste for days separately before you make up the rest of the ferment. 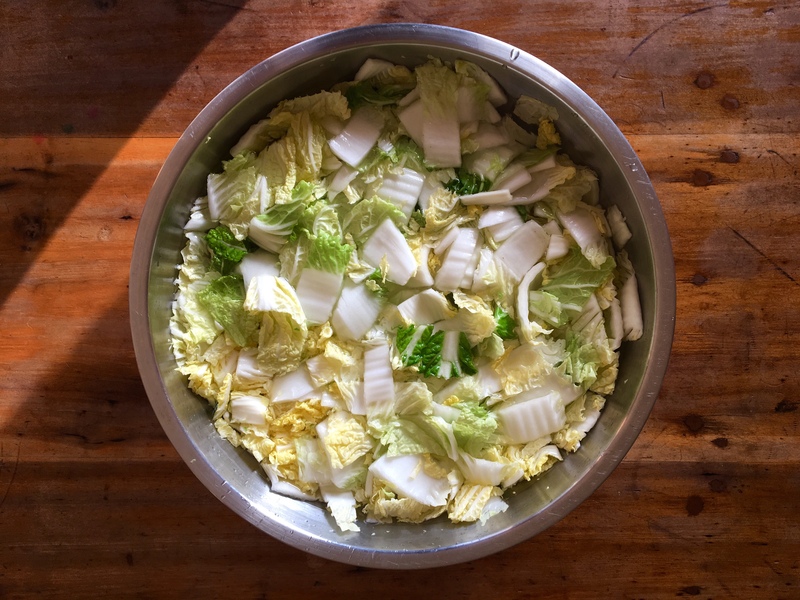 Kimchi has a relatively short fermentation time – usually between 3 – 5 days, and you also soak the cabbage for up to 24 hours on top of this. If you have a craving now, you are going to have to wait! 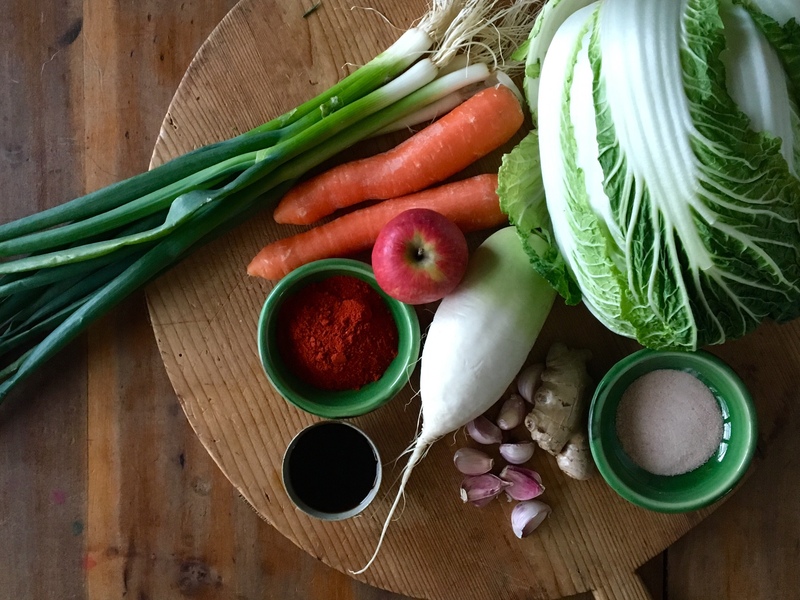 All the ingredients for kimchi ready to be chopped, minced and undergo the alchemy of fermentation. 1/4 cup Korean chilli powder (gochugaru) – you can increase this to up to 1/3 or even 1/2 a cup if you love super spicy. 3 tablespoons fish sauce (vegans can use 1 tablespoon of fermented, salted black beans or dark miso). Clean lidded jars to accommodate up to 4L of kimchi. Cut cabbage in quarters lengthwise. Cut out the fibrous core section ( I pop it in the fridge and chop it up into sticks for stir-fries or keep it for soup/bone broth). Cut the cabbage spears on the cross into approximately 5cm sections – this will make bite-size pieces! Place the chopped cabbage in a large bowl. Toss through the salt until the cabbage is evenly coated. Fill the bowl with water until the cabbage is just submerged. Cover the bowl and let it sit out of direct sunlight for between 2 to 24 hours. The longer you soak the cabbage, the silkier it becomes. If you like crunchier kimchi, you just keep the soaking hours at the lesser end of the timescale. When you have come to the end of the soaking time, drain the cabbage lightly rinse and let drain in a colander, occasionally tossing while you prepare the rest of the ingredients. Prepare the carrot and radish. For more glamourous kimchi you can julienne (cut into matchstick shape) the carrots and radish. I never have time for this, so I just coarsely grate them. Chop the roots off the spring onions and reserve for making stocks and bone broth. Chop the spring onions, the white part and the green tops. Whizz all the paste ingredients in a food processor or with a stick blender until it forms a paste. You can add a little water to achieve this. Now that you have all the paste and the phase 1 and 2 veggies prepped you can now put them all together in a big bowl. Toss the veggies and paste (I use my freshly washed and dried hands) until all the ingredients are evenly distributed. Now take handfuls and fill your jars one at a time. Keep mixing the ingredients in the bowl to make make sure the liquid is evenly distributed as you go. When the jar starts to become full you can then cram the kimchi in pushing it down; the liquid should then start to form a layer above the veggies. With a clean, wet cloth sponge wipe down excess kimchi from the outside and rim of the jar. Secure the lids not too tightly. Place the jars on a waterproof tray or baking dish and leave to ferment at room temperature, out of direct sunlight. 2 – 3 times a day you are going to have to “burp” your kimchi to let out any excess gasses, so the jars do not explode. If you have a fermentation lock for the top of your jars, apply them! When you burp, your jars use a clean stainless steel spoon to push the veggies down under the liquid as much as you can. On day 2 or 3 you will notice that the ferment starts to become fizzy. This is when you really need to start taking notice and take at a taste at the end of burping the jars. When ferment has lost its sweet taste (the bacteria eat up the sugars) and has hit a tangy level you like. That’s it – you can stop fermenting. Place your jars in the fridge. This will dramatically slow down the fermentation, and you will no longer need to burp the bottles. You can keep kimchi in the fridge for 4 – 6 weeks. Salted Asian cabbage, resting before being made into kimchi. You might be wondering why I use jars and not my fermentation crock. As I have said before, this is one funky ferment, and the smell can permeate your crock and weights. Until I have a dedicated kimchi crock, I am just going to have to put it in jars. Mmmmmm, now you are ready to get stuck into eating and enjoying your kimchi. Of course, it is going to pair well with Korean foods such as bimbap, Bulgogi and spring onion pancakes. There are lots of other foods it tastes excellent with – eggs (any which way), nourish bowls and fried rice, just to name a few. No doubt you will find your winning combinations too. Tell me about how you like your kimchi, I am always up for new ideas!